Over the last 14 years of living in Bangkok, Thailand, the amount of money I spend on eating out has decreased every month. As I’ve learned to eat like a Thai, and learned to eat where Thais eat, I’ve discovered my financial outlay for food has decreased yet the food I eat has become even more delicious. 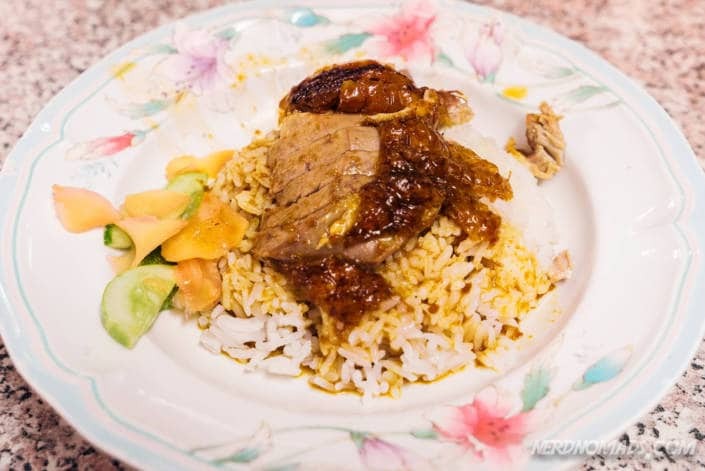 Yes, it is possible to eat cheaply in Bangkok. 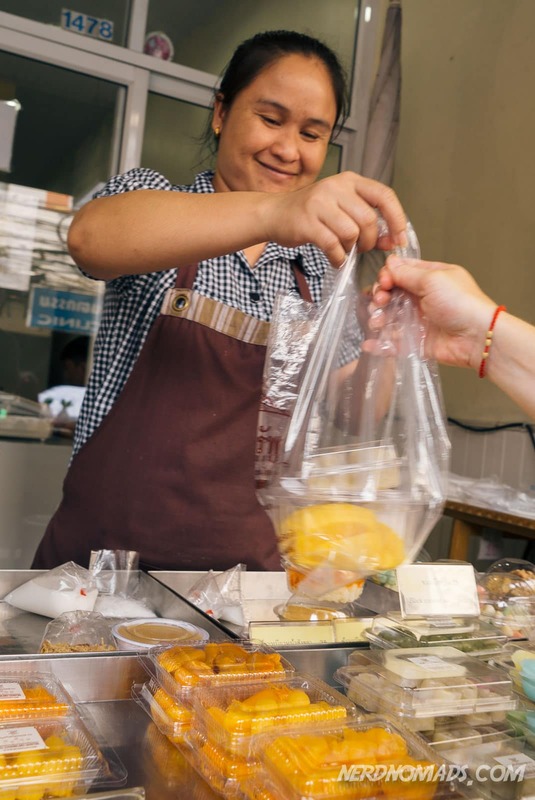 If you come to Thailand on a budget and don’t want to spend a lot of money on food, follow these tips and you’ll find you too can eat cheaply in Bangkok and still get to try the most delicious food. But you’re not going to go broke while you do it. 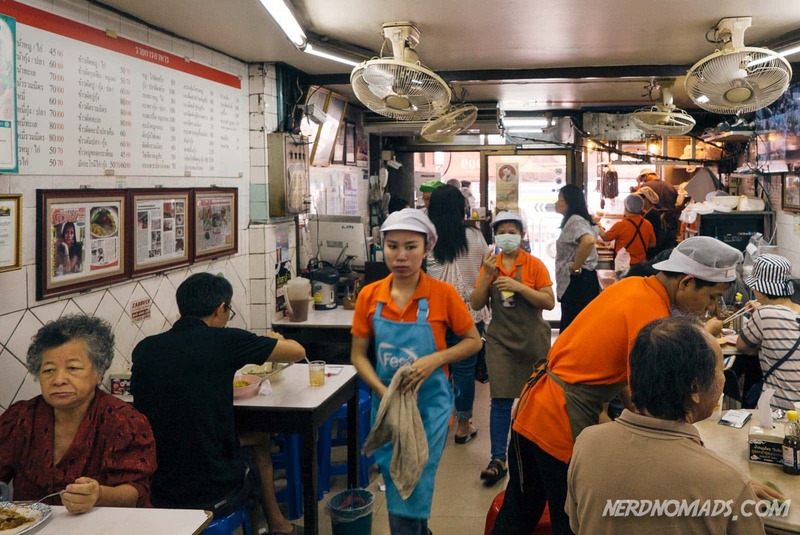 The best place to eat cheaply in Bangkok is at a Thai food stall. Food stalls are everywhere in Thailand, and just about on every street corner. 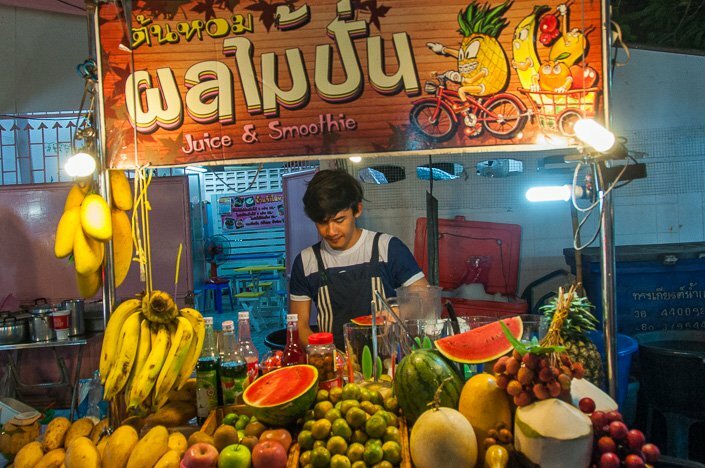 Food stalls sell everything from pork on a stick and sticky rice to noodles, Thai curries, pad thai, mango and sticky rice, sausages and cabbage, fried rice, papaya salad, chicken in coconut soup and about 175,000 other dishes. The average price for eating at a food stall in Thailand is around 40 baht or $1.25. That will get you a big bowl of something delicious. Add onto that another 15-20 baht (48 to 65 cents) for water or a can of coke and you’ve got a delicious, authentic Thai meal for less than $2. Plus, sitting outside at the food stalls, you get to see real Thai life going by and that makes it even more interesting. 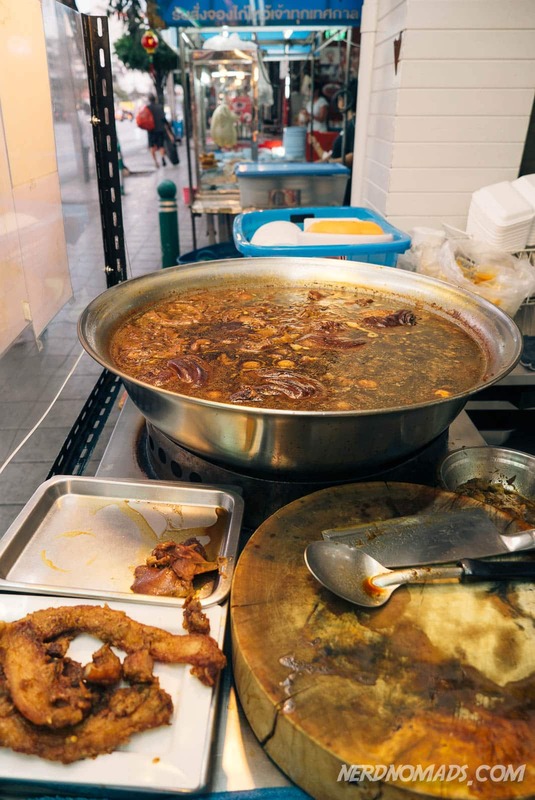 Eat at Food Courts – Another wonderful place to eat cheaply in Bangkok is at one of the thousands of food courts in the country. A food court is usually in a shopping mall or small shopping area and is an area of indoor food stalls around a common seating area. At food courts in Bangkok, you can get typical Thai food like pad thai, tom kha gai (chicken in coconut soup), fried bananas, roasted pumpkin, Thai spaghetti, pork or chicken satay, lots of vegetarian food, Thai desserts, fresh fruit juices, fruit and yoghurt shakes, ice cream and lots more. 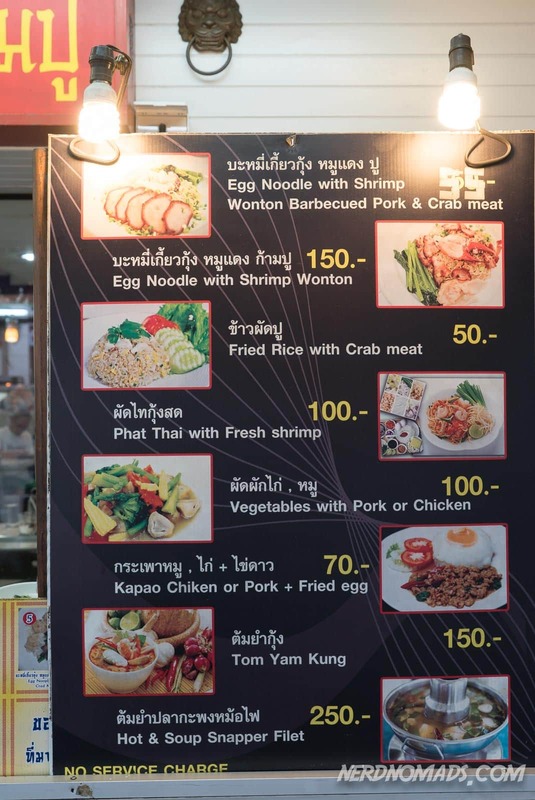 The great thing about food courts is they’re mostly inside, so they’re air conditioned, (a blessing in Thailand’s incredible heat) and yet, the prices are almost as cheap as the outdoor food stalls. For an average meal for two people at a food court, for instance, including a main meal, a dessert and a drink, you’re unlikely to spend more than $5, and even less than that if you choose wisely. 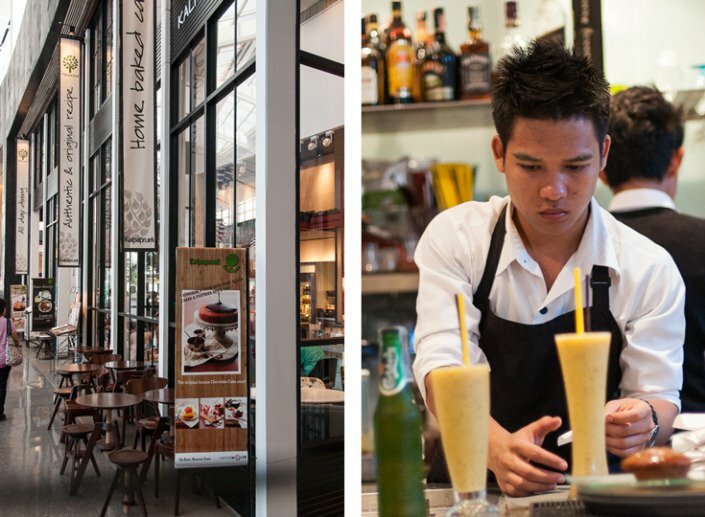 Some of the best food courts in Bangkok are at MBK shopping mall, Terminal 21 Mall, and Emporium shopping mall. Eat Noodles at 7-11 – One of the very cheap places to buy food is at a local 7-11 in Thailand, and there are thousands of them. Many Thais will eat a pot noodle for lunch, which they buy at a 7-11. All you do is get the pot of noodles, open it and add hot water (available at the 7-11 near the coke and coffee section), stir it, pay for it, wait 5 minutes and eat it. Simple as that. A pot noodle is about 20 baht (65 cents) and, wash it down with a bottle of water (10 baht or 33 cents), and you’ve got a filling meal for less than $1. As pot noodles are full of sodium and not really that healthy, I wouldn’t recommend eating them every day but, for a change once in a while, they make a great cheap meal. Eat at Noodle Restaurants – There are many cheap restaurants in Thailand that only serve noodles. But, when I say “only serve noodles”, they actually have around 50 styles of noodle, served with chicken, beef, port, or sea food and eaten wet or dry (with or without soup) and sometimes vegetables too. A bowl of noodles is filling and quite low calorie. Many noodle restaurants also sell a decent sized bowl for 35 baht ($1.10). Also, look out for boat noodle restaurants, which are popular in Thailand too. Boat noodles actually comes from when noodles used to be prepared on traveling boats on the river and then the seller would stop the boat outside your house and sell you some. Boat noodles are usually in smaller bowls and are sometimes sold as low as 15 baht (48 cents) per bowl. If you eat at a boat noodle shop though, you’ll probably find you need two or three bowls to really fill up. 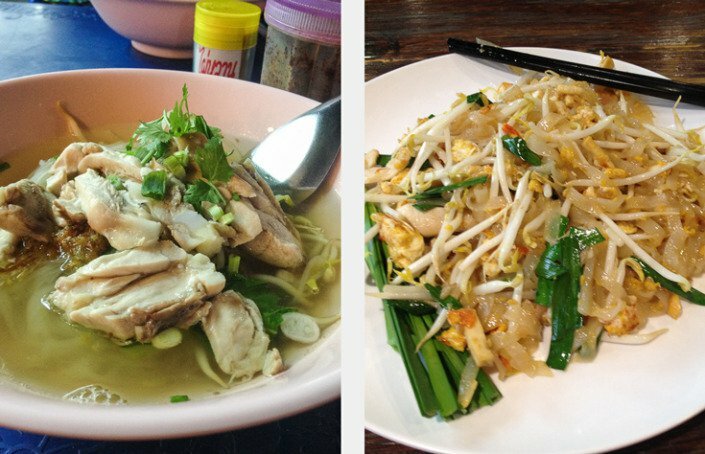 Eat ‘Thai Style’ – The favorite way for Thais to eat is what they call ‘Thai style’. Thai style basically means you order several dishes and then everyone shares. Thai style usually works out cheaper than western style as you can, conceivably, order three dishes for four people and still have enough food for everyone. Be warned though, if you decide to do this and are eating with Thais, Thais eat a lot of food. Even all the skinny Thai women manage to pack away more food than most western women could ever eat, so you’ll have to watch that you manage to get enough or you’ll walk away from the table still hungry. 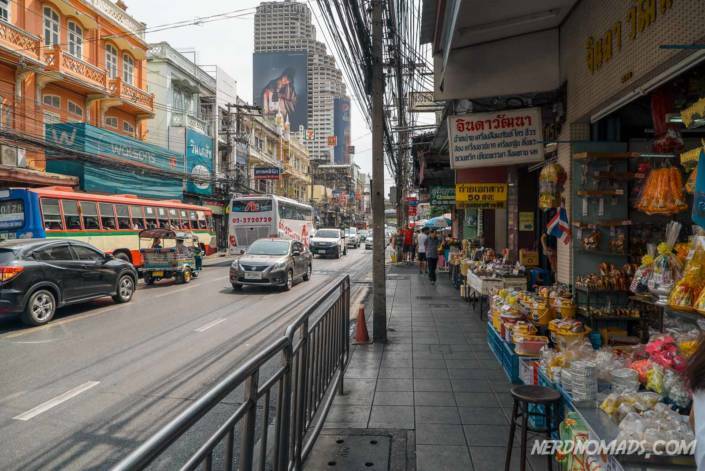 It’s easy to eat cheaply in Bangkok, as long as you avoid the western restaurants, the more hi-so (high-society) Thai restaurants, and the hotels. 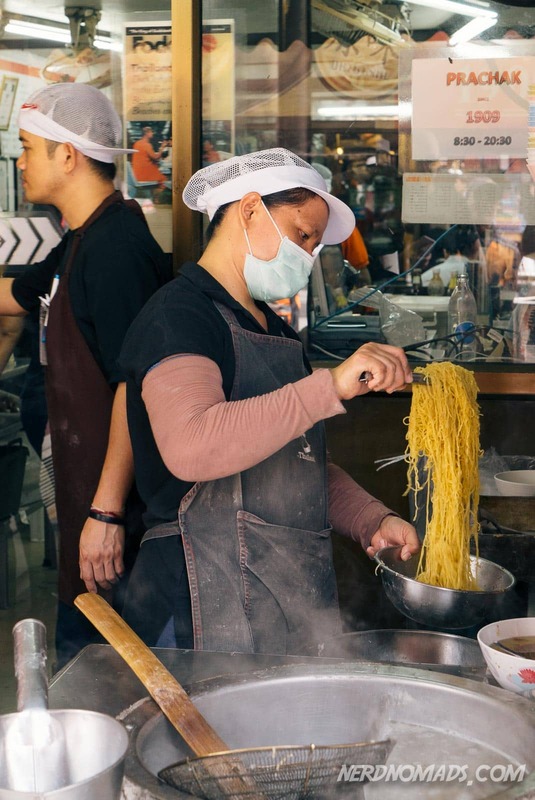 If you stick to eating at Thai food stalls, food courts, eat noodles or eat Thai style, you’ll find you can easily eat on less than $5 a day in Thailand, and still eat some of the most delicious food you’ve ever tasted. If you are staying near Silom, then Bangrak Cafe is a cool and hip little place with excellent Thai food! 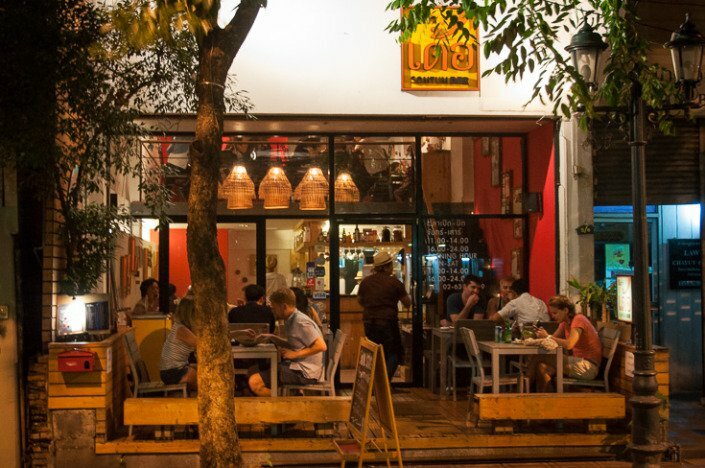 The place has a friendly and relaxed atmosphere, with live music and even an art exhibition now and then. 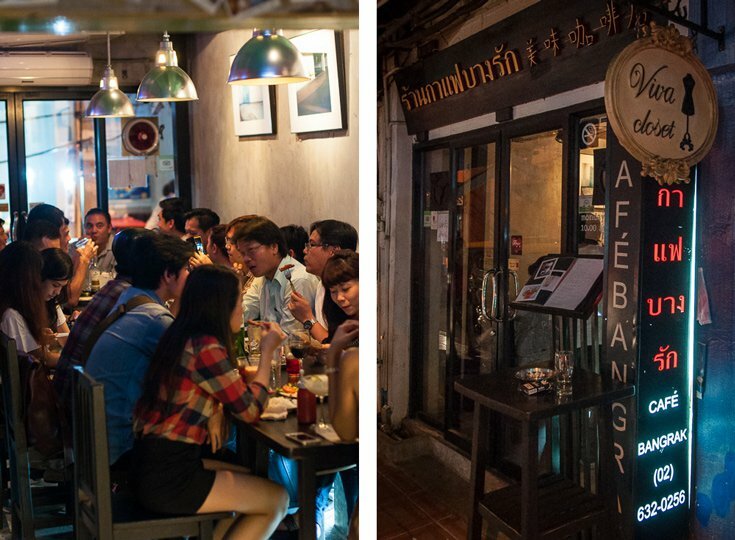 Bangrak cafe is popular among Thais as well as westerners living in Bangkok. They also serve great smoothies and drinks (with alcohol). We particularly like the shrimps wrapped in crispy bacon, chicken wings, red curry chicken and chicken cashew nuts. So tasty! Crispy Chicken Wings at Bangrak cafe. 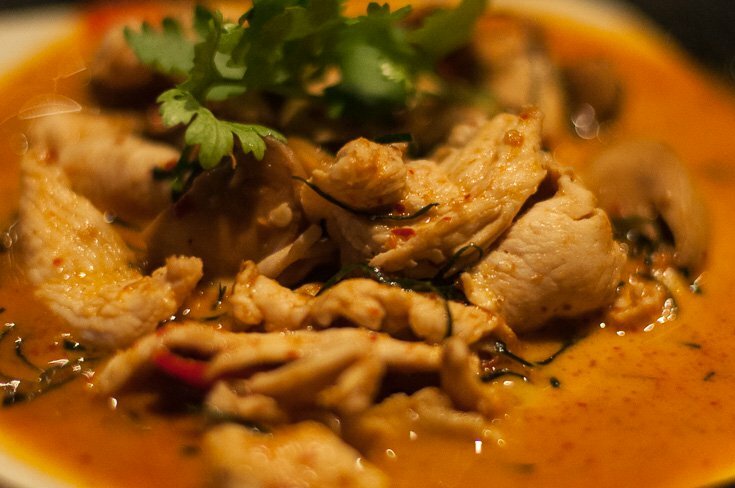 The red curry chicken at Bangrak is one of our favorites! 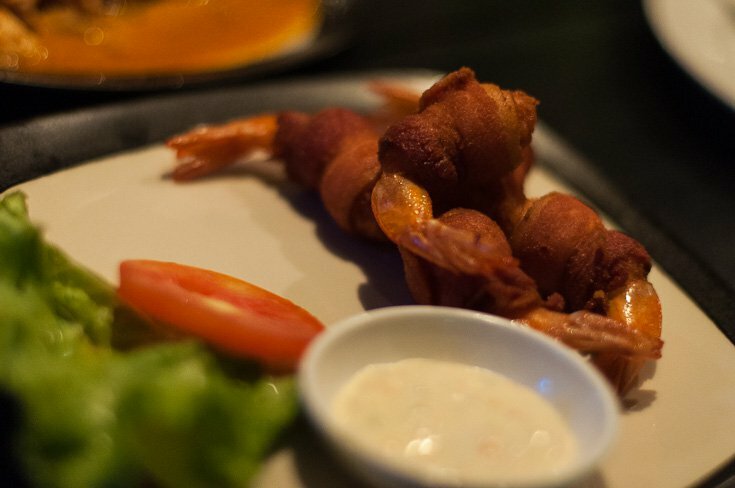 Shrimps wrapped in crispy bacon at Bangrak cafe. How to get there: Take the sky train to Silom station, and walk from there (very short). Opening hours: 10 a.m. – 10 p.m. Closed on Sundays. 2. 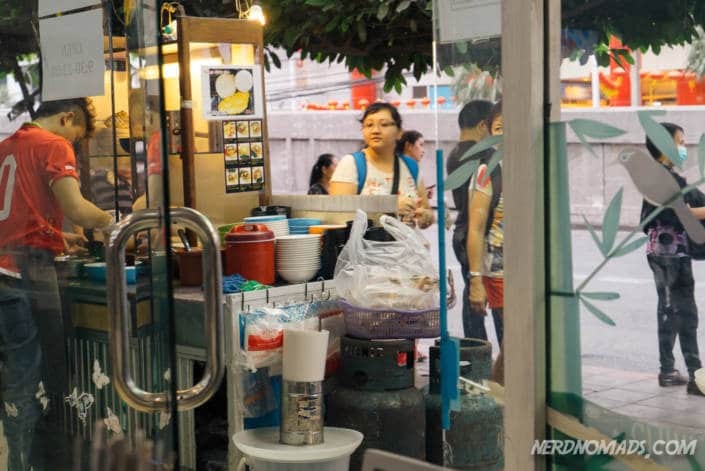 Bangkok’s Delicious Street Food! 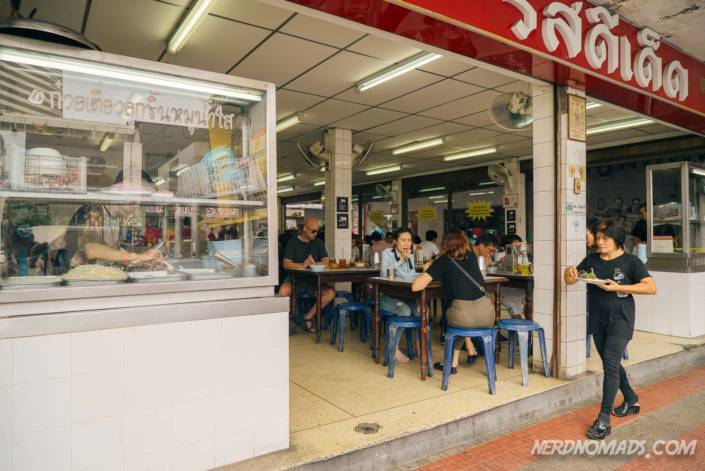 All over Bangkok, you will find cheap and delicious Thai food on the street! 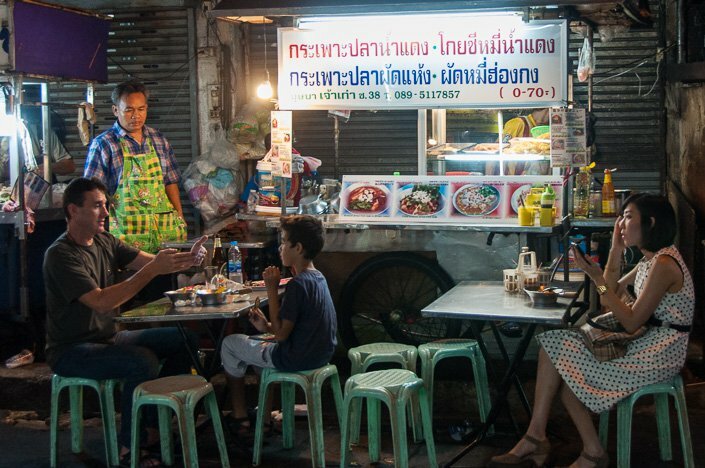 Some places are pop-up food stalls that move around on trolleys, while others are more or less permanent, serving fresh and tasty Thai food at small tables on the street pavement. Street food in Bangkok is tasty, quickly delivered and super cheap. You can usually have a feast for under 150 Baht! 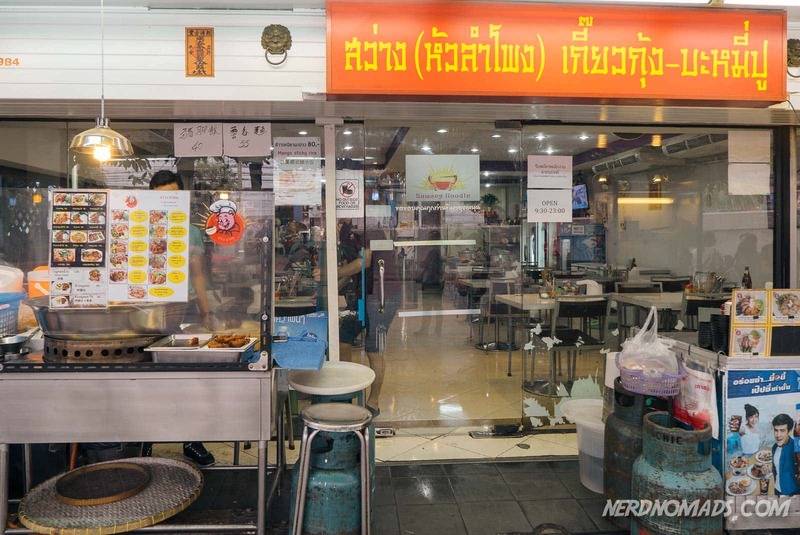 We used to love and recommend the food market at Sukhumvit Soi 38 but after serving delicious street food for decades, it has now sadly closed down. But fear not, Bangkok is the street food capital of the world, and there is plenty of fantastic options to sample the street food. Bangkok’s Chinatown know locally as Yaowarat, is a great place to sample some street food, and is arguably Bangkok’s street food center. All along Yaowarat road, street stalls and small restaurants serve up some seriously tasty treats. 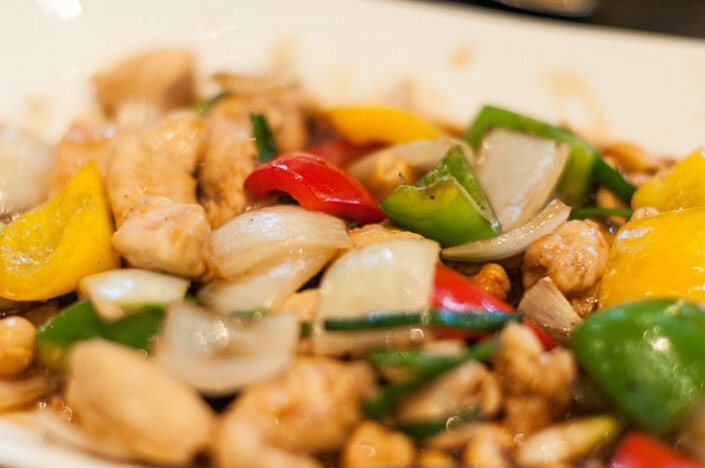 The mix of Thai and Chinese dishes on offer is staggering, and the smells are heavenly. A good strategy is usually just to try what looks and perhaps most importantly smells best to you. Barbecued seafood is seriously popular here, as is flat noodles in pepper broth, dim sun and all sort of fruit desserts. Walking around you can find all kinds of Thai food, from Satay, pad Thai, barbecue spears with peanut butter, chicken in different variations, fried rice, noodles and different soups, crispy duck and curries of all kinds. Make sure to sample small portions, and do not fill up all in one place. While you can find food here all day, it comes alive in the evening when people come out to eat. Delicious juices and smoothies, all freshly made! If you are in this area and find yourself with a craving for Indian food, Bangkok’s little India district (Pahurat) is also not far away. How to get there: Taxi or MRT to Hua Lamphong station then walk 15 minutes. Having Chicken Massaman Curry at a Bangkok street food restaurant. Very tasty! This is an old part of town with many restaurants and food stalls that have been there for decades! These guys know some cooking secrets that would put the finest French chefs to shame. The stretch of road going from Saphan Taksin BTS station to the crossing of Charoen Krung Road and Silom Road is a foodies dream walk. There are simply too many food gems along this road to mention them all but here lies Prachak Pet Jang famous for its Chinese-style roasted duck with a dark, spicy sauce over rice. It is delicious! 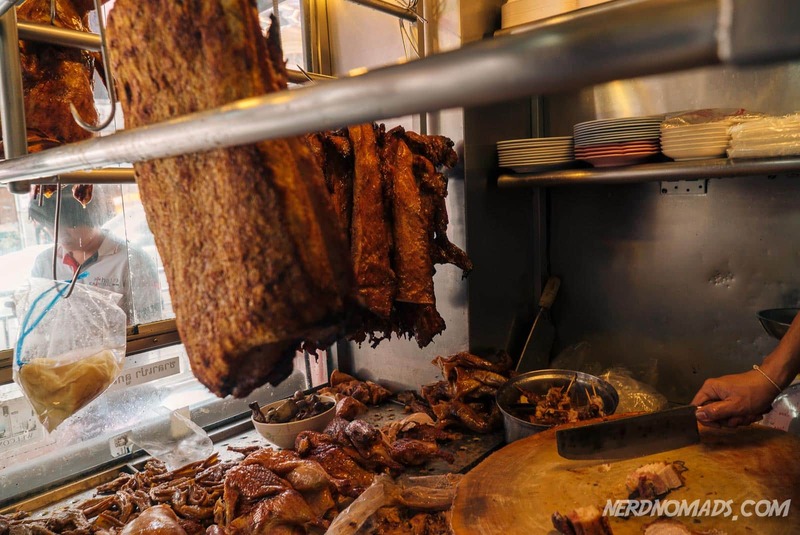 The skin is perfectly crispy while the duck meat is super juicy. The rice is cooked perfectly and the Chinese sausage is delicious slightly sweet. Mmmmmm! 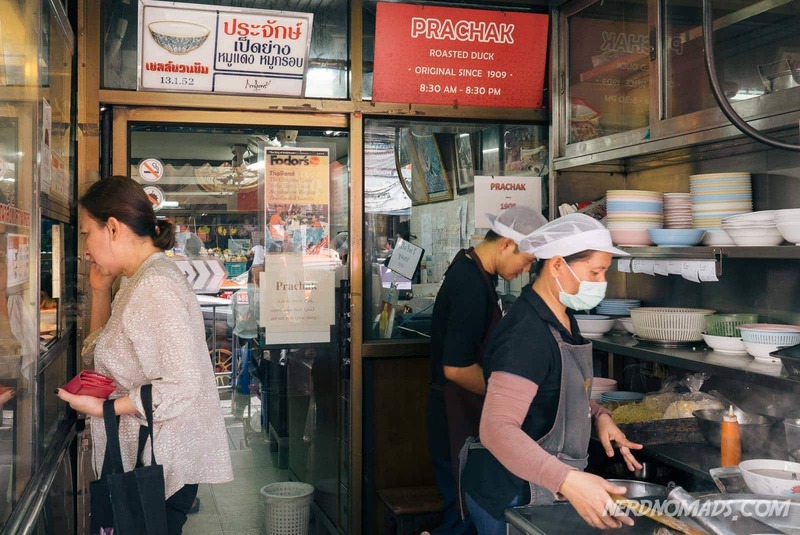 Prachak is an institution, and has served roasted duck to hungry Thais since 1909! How to get there: Take the sky train to Saphan Taksin sky train station, and walk from there. 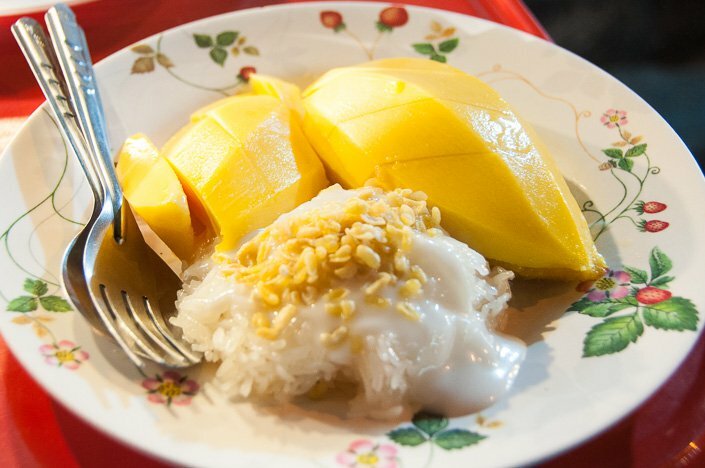 After having delicious crispy duck at Prachak, walk across the street for some mouth-watering Mango sticky rice dessert at Boonsap Thai Desserts. You can either sit there and have your dessert or have takeaway. 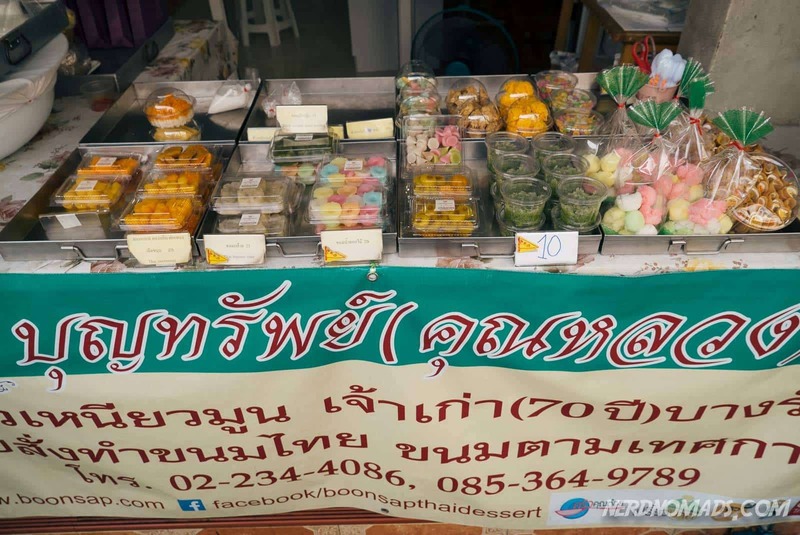 They also sell other lovely Thai desserts, cookies, and sweets. Sticky rice with mango and coconut milk. Yummy!!! Some other great places to sample street food in Bangkok is around the Victory Monument and on Pectchaburi Soi 5 and many others. 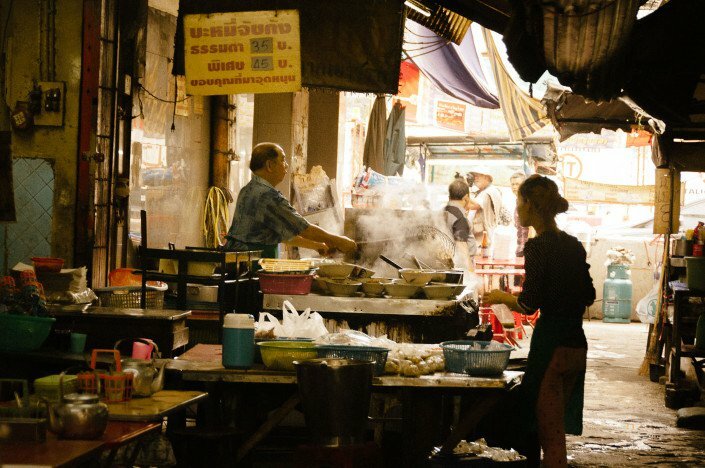 Bangkok’s street food is everywhere and is almost always tasty and freshly made, so step out of your hotel and explore! 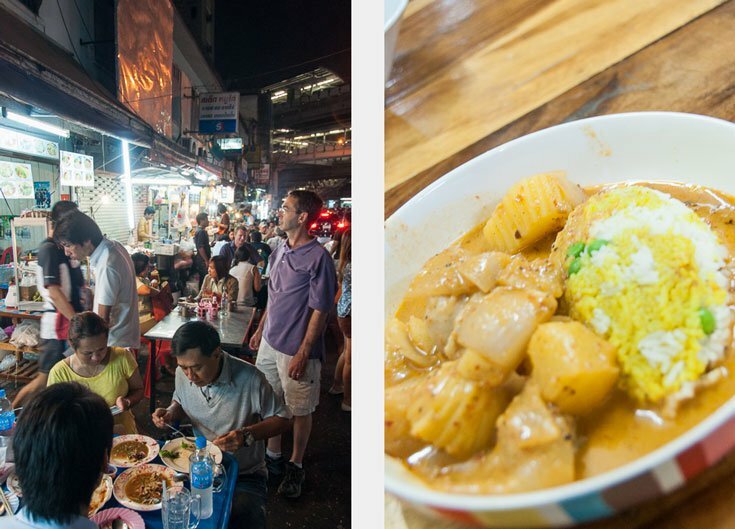 Another great way to explore Bangkok’s street food is to take a food tour. 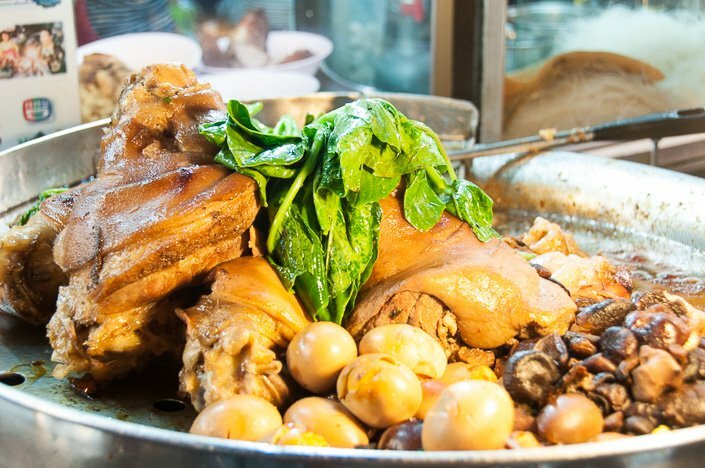 By going on a food tour with an expert English-speaking guide, you will get to sample a lot of food you might otherwise have missed. It is also an excellent way to learn more about Bangkok’s culture and food. Our friends at Expique just started an Evening Food and Tuk Tuk Adventure tour! It looks absolutely awesome and we can’t wait to go back to Bangkok and try it out. What better way to spend an evening in Bangkok than whizzing around from one fabulous food experience to another in a Tuk Tuk! If you’d rather do a walking food tour during the day, then the Old Town Food Tour is a small group, half-day tour of five different locations, including more than eight food and drink samples. In between the food stops, it also explores several historic temples hidden inside this neighborhood. Click here for more information & tickets. This restaurant is a real gourmet treasure in Bangkok! The food is stunning, both in its presentation and taste! Each evening the chef has a set menu where you can choose between two starters, two main dishes, and two desserts. In between, you also get two small dishes, so altogether five dishes. All dishes are composed to fit together as a whole set dinner. It all cost 1100 Baht per person, not including drinks. Expensive by Thai standards, but so much value for your money compared to what you would have to pay for this kind of gourmet dinner in Europe or USA! This is a real gourmet restaurant. If you are looking for a place to eat for a special occasion, for instance celebrating a birthday or anniversary, then this is the perfect place! How to get there: Take the sky train to Silom station, and walk from there. Opening hours: Only open in the evenings, from around 6 p.m. Pre-book a table, as this place is small and very popular! If you are looking for a relaxed and reasonably priced place to eat while shopping in Siam, then Kalpapruek on the 7th floor of Central World is a good choice. Almost all of the big and posh shopping centers in Bangkok have food courts with food from all around the world. Most of them are in big open areas, which can get very crowded and noisy. Maria is entering Kalpapruek restaurant at Central World, 7th floor. Kalpapruek restaurant is very popular among local Thais. 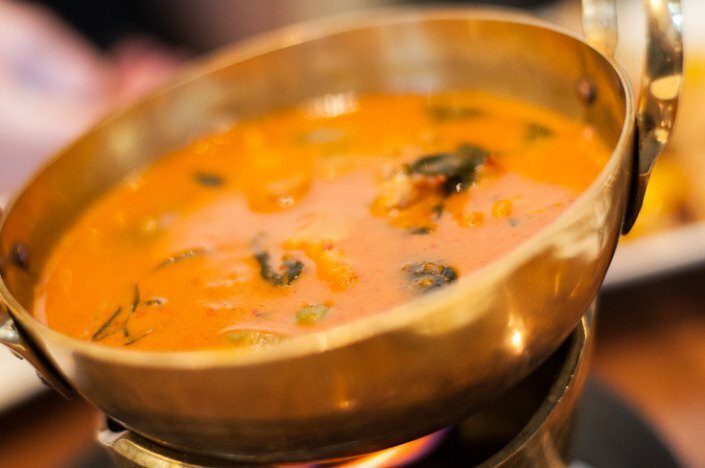 With its friendly and relaxed atmosphere, and reasonably priced tasty Thai food, delicious smoothies, yummy cakes and excellent service, it is the perfect place to get your energy back in between the shopping! You must try the Mango Bingo smoothie; it`s sooooo good! If you are not that hungry, and more up for something sweet, try one of their super tasty cakes! Tasty chicken with cashew nuts at Kalpapruek restaurant. Our favorite! Delicious red curry chicken at Kalpapruek restaurant. Kalpapruek restaurant also has a bakery and makes super tasty cakes as the lovely chocolate cake on their poster to the left. On the right is a waiter with our Mango Bingo smoothies. Mmmm! If you’re looking to escape the shopping malls and have an authentic Thai meal in this area, you should head for Rot Dee Det at the edge of Siam Square. 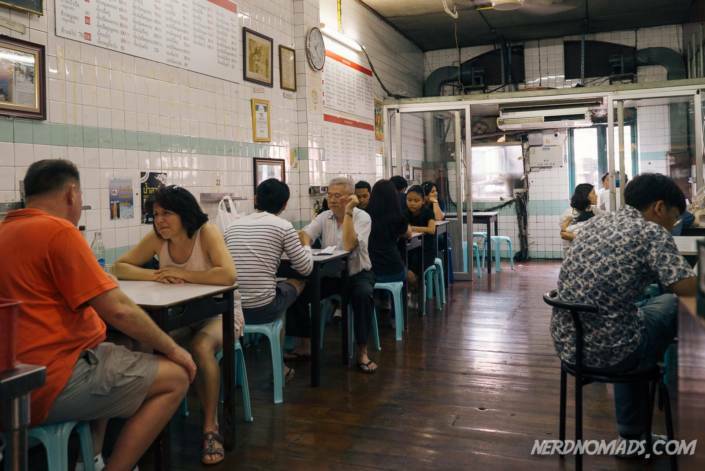 In an area mostly dominated by the larger food chains, Rot Dee Det is an institution. Expect plastic chairs and plates in a simple nonair-conditioned locale. But also expect some fantastically tasty Thai dishes. 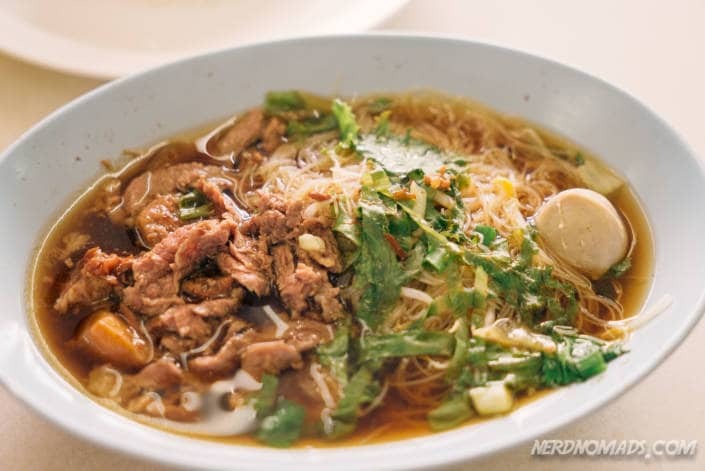 Their beef noodle soup is so flavorful it is almost too much! 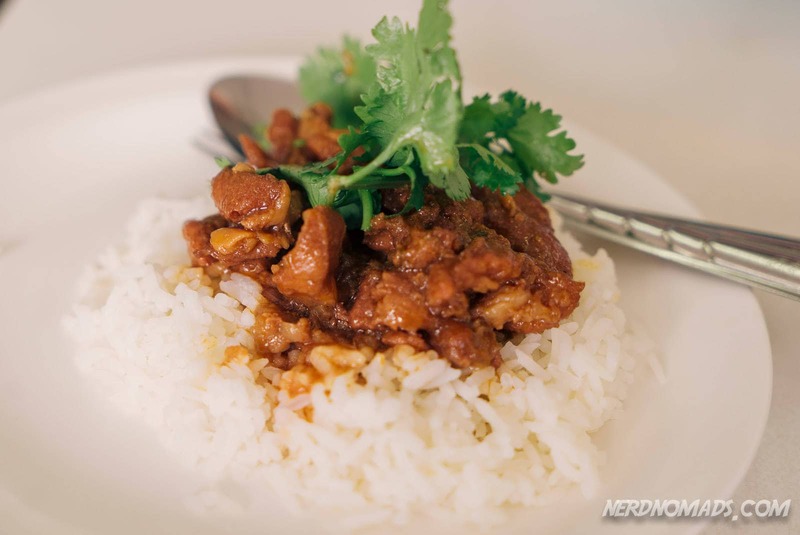 And the Moo Wan (sweet pork) is mouth-wateringly delicious. Avoid lunch time as it gets extremely busy. Somtum Der is a small cozy restaurant serving delicious northeast Isaan Thai food! The restaurant has a great outside area where you can sit and eat and drink their tasty martinis of vodka and lemongrass or Rosella. 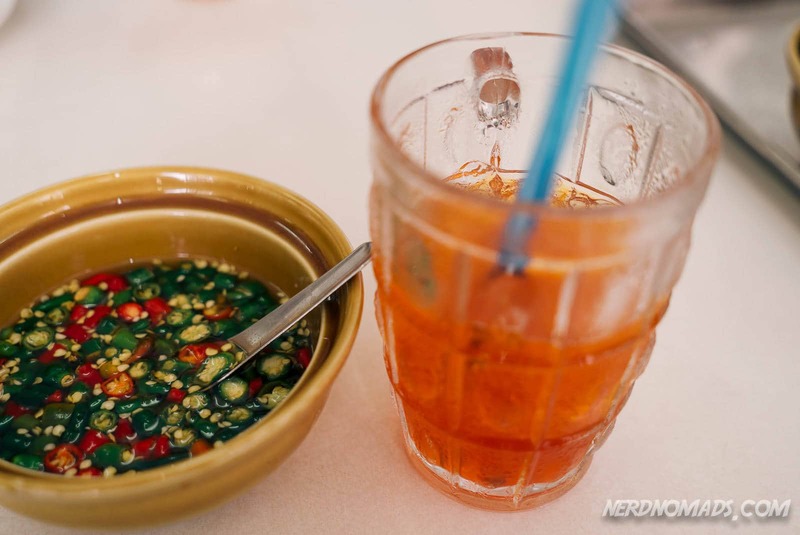 Their specialty is the Som Tam (Papaya Salad), of which they have eight versions of the menu. Som Tam/ Papaya Salad with shrimps. 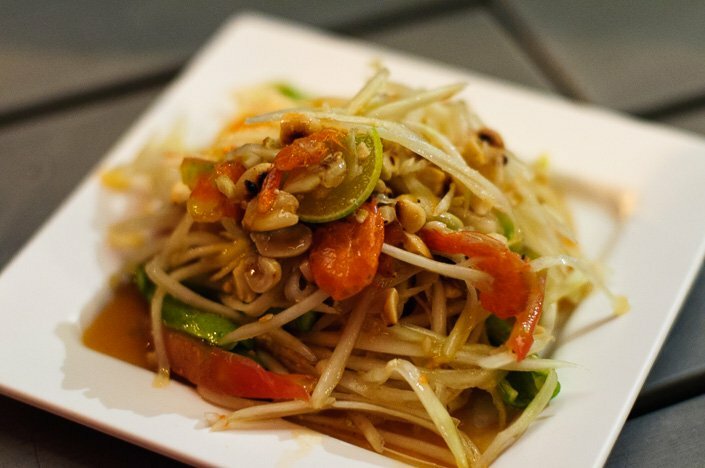 The easiest for beginners is the Tum Thai, the base papaya salad made with papaya, limes, tomato, chilies, peanuts and palm sugar. The Tum Thai Kai Kem with salted boiled egg and the Tum Kor Moo Yang with savory grilled pork neck are also delicious! Whatever Som Tam you try, order the black or regular sticky rice and dip it into the leftover sauce. Yummy! The real star on the Somtum Der`s menu is the Moo Ping Kati Sod, thin-sliced pork (or beef) skewers marinated in coconut milk, and then grilled until the marinade caramelizes. Served with nests of coconut-scented rice noodle. So tasty! Also, the house special grilled marinated Pork is delicious! Somtum Der also has desserts on the menu, like the Thai-styled Ice Kajang, a dish that looks intimidating and impressive but is mostly air. Harder to get past is its flavor. Let’s just say that if you’re a real fan of white bread and pink bubble gum; this is probably the desert for you! Cozy outside sitting area at Somtum Der. 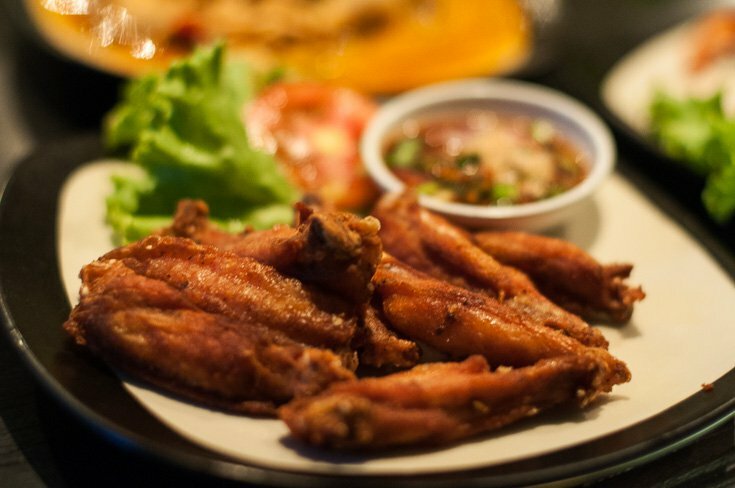 Somtum Der is an affordable, friendly place with delicious and authentic north Isaan Thai food. The atmosphere is great! They also have a restaurant in New York with the same name. Opening hours: 11 a.m. – 12 p.m. Closed on Sundays. 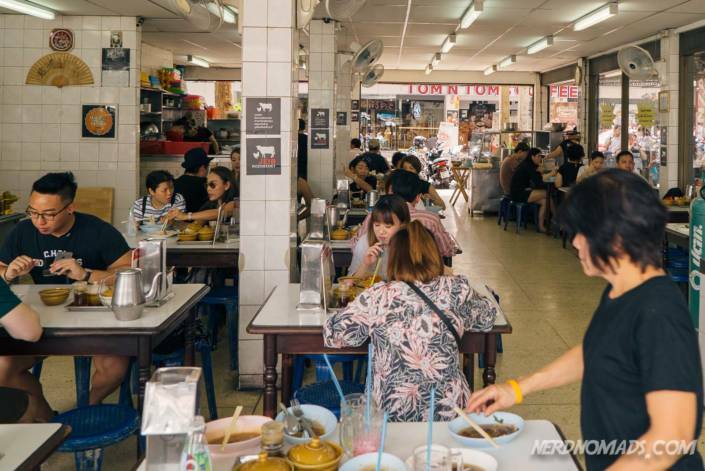 The famous and legendary noodle cafe that used to be called Bamee Sawang Noodle, moved and switched its name to just Sawang Noodle in 2016. 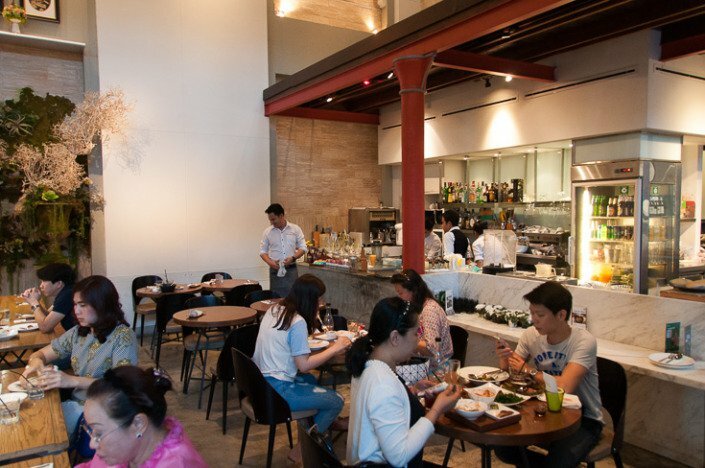 It was originally located in the Hua Lam Phong are, next to Bangkok train station, but has moved to 982 Phetchaburi Road close to Central World at Siam. 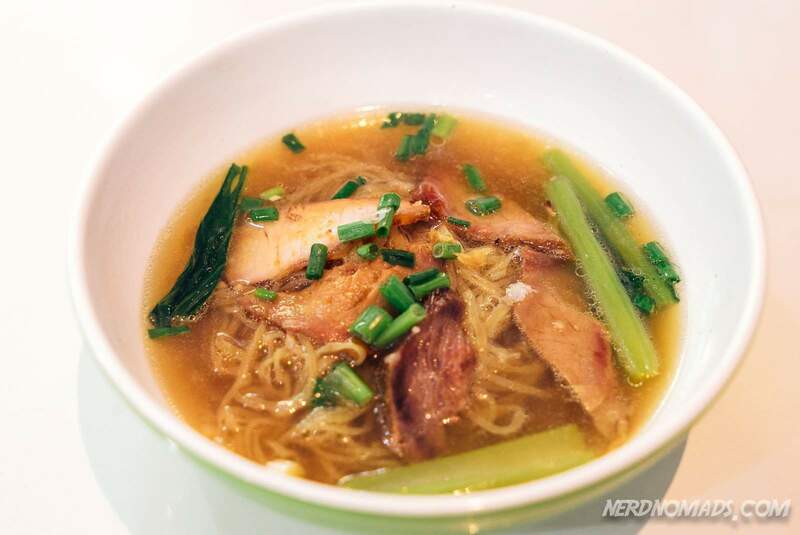 Sawang still serves one of Bangkok’s best noodle soups! The egg noodles are hand-made, the barbecued pork is delicious and honey sweet, and the crab is salty and tasty! But is it as special as it once was? No, the old wood fire ovens have been replaced by gas and the new location lacks the old world charm and history of the previous place. There is the feeling that a new generation has taken over the restaurant. But the noodle soup is still tasty and worth a visit if you find yourself in its new neighborhood. The noodle soup is still cooked outside the restaurant on the street, but you have to sit inside and eat. 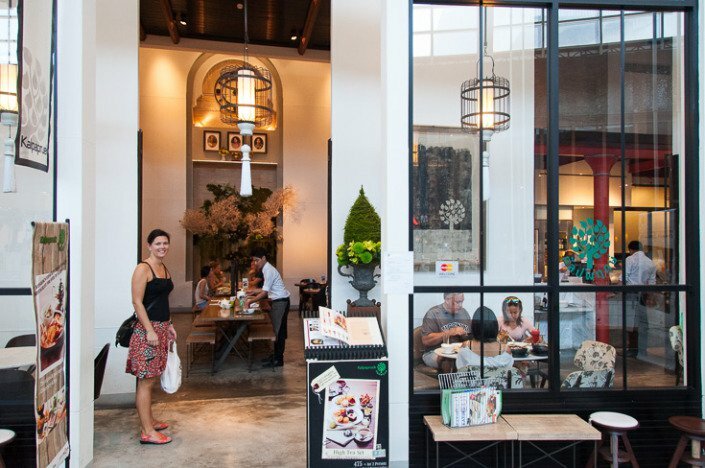 The Sawang noodle cafe has moved from the original Hua Lam Phong location (near Bangkok train station Hua Lamphong) and is now at 982 Phetchaburi Road. The sign is on the glass door rather than on the main sign above so you have to look for it and it says Sawang Noodle. How to get there: Take the Skytrain to Siam or Chit Lom station, and walk from there. Tui tưởng ông post trải nghiệm chuyến đi của ông chớ. Bun' wrote: Tui tưởng ông post trải nghiệm chuyến đi của ông chớ. không có ăn hết nhưng ăn chổ khác ..